Tabasco sauce is a spicy, red colored sauce that originated in the USA. Even though it is made with only 3 ingredients – red peppers, salt and vinegar, it takes at least 3 years to produce. The red colored peppers are crushed and left to age for about 3 years to enhance their flavor and then mixed in with the vinegar and salt. This condiment is ideal to fulfill any spicy needs one might have due to its rich, spicy and tangy taste. Being one of the most used hot sauces around the world, one can only imagine the dishes to which you can add this wonder ingredient. This sauce can be used to make other epic sauces as well, like a smoky barbecue sauce which is the marination for a Grilled Hot and Sweet Paneer. The best part about tabasco is that one drop makes a lot of difference so just spread some spicy tabasco over a Creamy Spinach Toast or a Grilled Corn Toast to add a zingy, hot taste to them. Simply add a few drops to a veggie mayo mix and stuff it inside the Mayo Veggie Curd Sandwich for a strong and spicy flavor against the coolness of the curd. It’s a fact that Mexican food is really spicy with a kick of chilli. Chilli Con Carne, or Spicy Refried Beans, is a Mexican specialty where kidney beans are cooked down in a thick sauce of onions, garlic, tomatoes and chilli sauce. Many recipes also make use of tabasco to add that extra kick of chillies to it. Due to the unique taste, this sauce can be used in many different ways, in many different dishes. A really new way to eat this sauce is to add to it so soups. These soups can be either hot soups or cold soups, or even made with unalike ingredients. Gazpacho, a Spanish cold soup which is made by simply blending the ingredients together gives a punch of spiciness because of the tabasco peppers and it tastes wonderful. As strange as it sounds, one of the main ingredients of the mocktail, Virgin Mary, is hot sauce! this tomato based drink, the non-alcoholic counter part of bloody mary, can be enjoyed any time of the day, all throughout the year! Better the taste of different dips like the Cheesy corn dip and a Yogurt Dip by adding a little spicy tabasco to the mix. 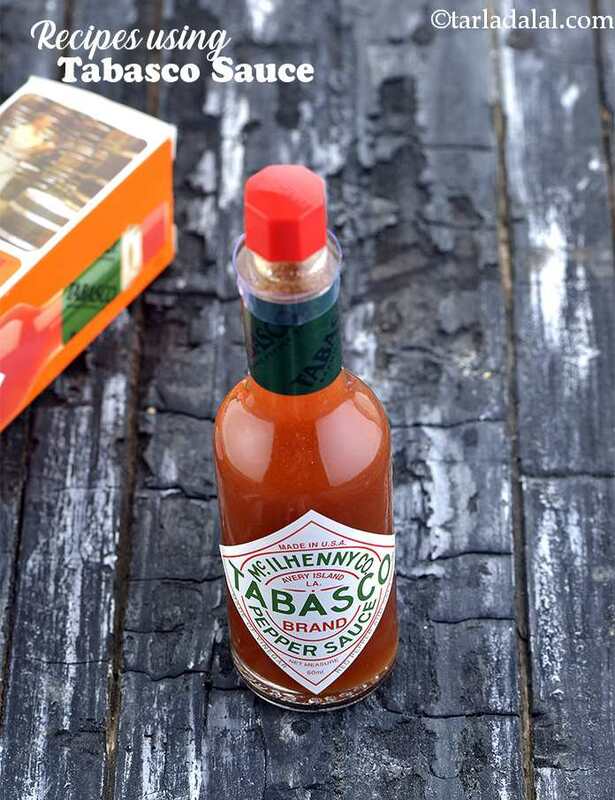 Enjoy our recipes using tabasco below. Maize flour tortillas, interlaced with refried beans and lightly sauteed vegetables and topped with a capsicum sauce. Sautéed broccoli combined with soft paneer and marinated in a spicy and flavoursome red pepper sauce, makes a delicious and nutritionally-balanced starter. Remember to serve these hot! A chilled Mexican soup, ideal for the summer.